Danny Clinch's massive new book of photographs, Still Moving, is out now, to grace discerning coffee tables as the holidays approach. As long as those tables are sturdy — this sucker is heavy! 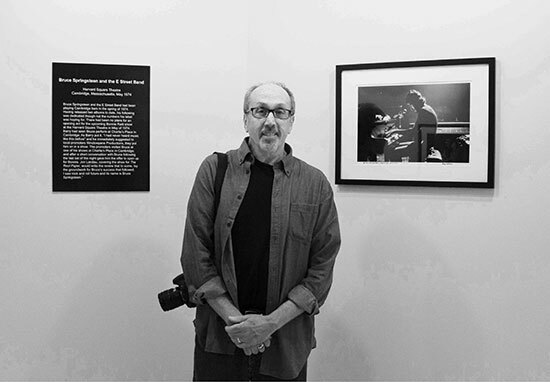 Congrats to Danny on such a beautiful, career-spanning collection of images, from Bruce to E Street and beyond. 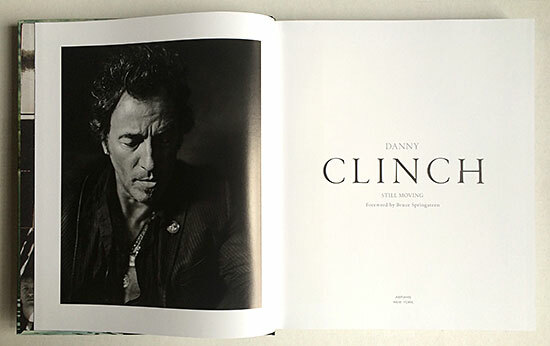 With Danny as a guest on his Bruce Brunch program last week, DJ and host Tom Cunningham called that foreword "one of the most beautiful things that I've ever read... you can tell the love and respect that he put into writing this." Clinch says the foreword blew his mind: "I couldn't believe it. I had to read it like ten times just to wrap my head around it. It was very moving for me; I honestly couldn't believe it. I asked him, casually, if he would be interested in writing something for the book, and he agreed... but I was really amazed at how seriously he took it." Here at Backstreet Records, we're in the process of sending out signed copies now to everyone who pre-ordered... with limited quantities still available! Last week's 65th birthday for Bruce Springsteen also brought a special celebration for fans: "An Evening With Thom Zimny" at Monmouth University. The September 23 event at the University's Pollak Theatre, presented by the Friends of the Bruce Springsteen Special Collection, promised surprises from the vault; the filmmaker and official Bruce Springsteen archivist did not disappoint. Leading off with footage from a 1977 birthday celebration (complete with guitar-shaped cake) straight into "Tenth Avenue Freeze-out" from 1976 (with the Miami Horns! ), the two-hour-plus showcase was a visual feast for fans. Backstreets' own Chris Phillips chaired the proceedings, introducing each film segment and interviewing Zimny along the way about a range of topics including his filmmaking process, what it's like to work with Bruce, and how concert performances are filmed. Showing Hunter of Invisible Game on the big screen for the first time — Zimny thanked the crowd for allowing him the honor — they touched on The Searchers as an influence and discussed the way Springsteen developed his character for films like this and "A Night With the Jersey Devil," also screened. Zimny [above left, with Phillips] also talked about cutting performance films from Chris Hilson-directed live footage, compared with directing and even storyboarding his own (as with 2009's full Darkness performance filmed at the Paramount Theatre, from which "The Promised Land" was screened). Sometimes the camera operators really just have to fend for themselves, as Zimny described while introducing Springsteen's daredevil performance of the "Apollo Medley" at the Apollo Theater. He noticed Bruce scoping out the Apollo interior during soundcheck for the live broadcast, but no one had any inkling that Bruce intended to perform death-defying feats on the balcony. The resulting footage cut together by Zimny, with cameras scrambling to track Springsteen's clambering up to the balcony and shimmying back down, perfectly captured the surprise of that night. In the audience were former Springsteen manager Carl "Tinker" West, Bruce Brunch host Tom Cunningham, and engineer/audio archivist Toby Scott. 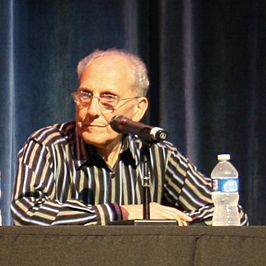 A beaming Vini Lopez [right] was also in attendance and could at times be heard singing harmony along with the film audio; he received his own well-deserved standing ovation from the audience at the conclusion of the evening. "I was very touched; that was very nice," he remarked later. "I just keep trying to work and do what I do," and people (including the Rock and Roll Hall of Fame) finally noticed. Lopez had seen some of the selections before but was surprised to see footage like "New York City Serenade." "If I had that shirt I'd still wear it," he said. "It was great to see that stuff up on the big screen." 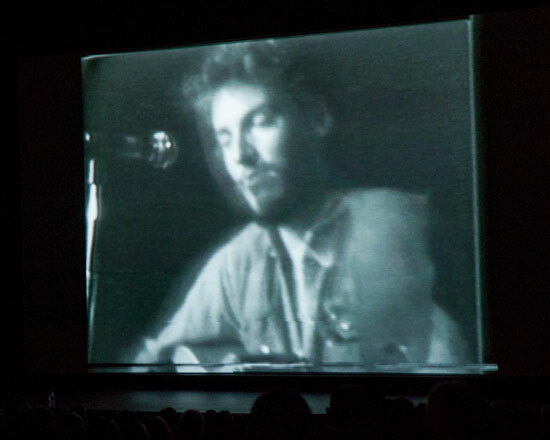 The night closed with one more silver screen debut, the recent fan-centric video for "Dream Baby Dream" that showed, as Phillips said, "the effect Bruce Springsteen still has on an audience at age 65." Zimny did not take audience questions during the event, and details about ongoing/upcoming projects were scant. But when asked about his approach to working with Bruce, Zimny commented, "Sometimes magic happens by accident" if the right parts have been assembled. Indeed it does. This November, Columbia Records/Legacy Recordings is set to release a box set that utilizes state-of-the-art technology to revisit several of Springsteen’s classic recordings: the incredible run of albums from his first decade in the studio. 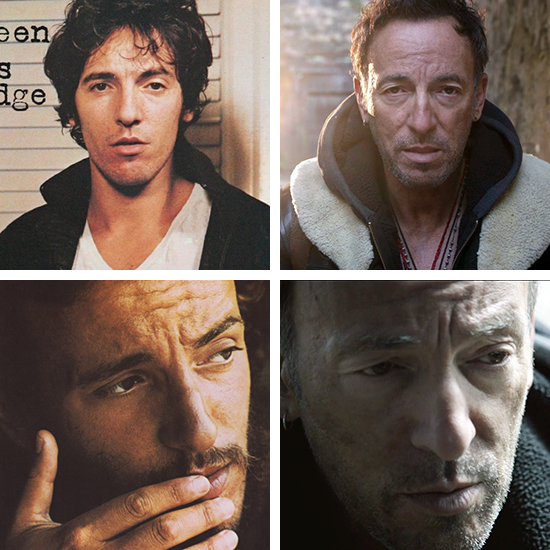 Bruce Springsteen: The Album Collection Vol. 1 1973-1984 contains newly remastered editions of Springsteen's first seven LPs, Greetings From Asbury Park, N.J. through Born in the U.SA, and will be available in both vinyl and CD configurations. Since 1992, when Columbia reissued Born to Run in a gold-CD MasterSound edition, many fans have hoped for remastered upgrades to the rest of Springsteen's catalog for the digital age; in the 22 years since, only Born to Run and Darkness on the Edge of Town have received that treatment, as part of their respective box sets. The wait ends here, including fresh remasters of BTR and Darkness, which benefit from a previously unavailable tape transfer technique — more on that in a moment. All seven of the albums are newly remastered, five for the first time ever, and all are making their remastered debuts on vinyl. 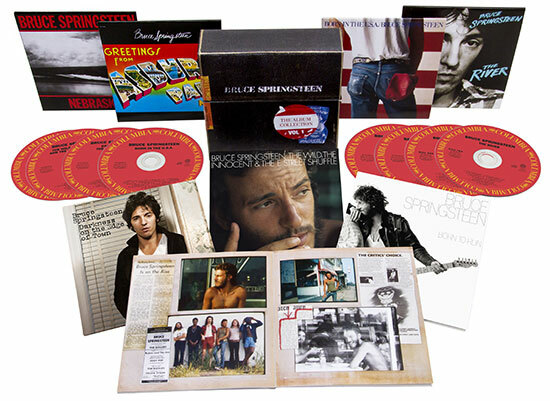 Original LP packaging is being replicated for each, and the box set also includes a 60-page book featuring rarely seen photos, memorabilia, and original press clippings from Springsteen's first ten years as a recording artist. For the audio, renowned mastering engineer Bob Ludwig is again at the helm. A partner to Springsteen since coming in to assist with the challenges of Nebraska in '82, Ludwig has handled mastering for the vast majority of Springsteen's output over the last 30 years, as well as the remastering: he was the ears for Born to Run's '92 MasterSound reissue and its 30th Anniversary remaster, along with the 2010 edition of Darkness on the Edge of Town for The Promise box set. Backstreets recently had a chance to speak with Ludwig, to find out further details about what this massive project entailed and what listeners can expect. We first heard a sampling of the catalog upgrade earlier this year, when a number of Springsteen albums spanning the past 40 years were made available on iTunes in newly remastered form. Ludwig confirms that Apple's 'Mastered for iTunes' initiative was the catalyst for this effort. "Mastered for iTunes slowly started three years ago," he says, "but it's now pretty standard for any new project. It involves starting from 24-bit sources instead of the CD's 16-bit standard, from which all downloads were formerly created." Bruce Springsteen: The Album Collection Vol. 1 1973-1984 will be released on November 17. Backstreet Records will be carrying both configurations; watch this space, and we'll make an announcement when we begin taking pre-orders. DO WE HAVE TO SAY THE NUMBER? "I'm a lifetime musician; I'm going to be playing music forever. I don't foresee a time when I would not be onstage somewhere, playing a guitar and playing it loud, with power and passion. I look forward to being 60 or 65 and doing that." And now it's here... and now it's here. And every bit of that volume, power, and passion is still here, too. Happy birthday, Bruce. We look forward to you being 70 or 75 or 80 and still doing that. Plenty of fun birthday tributes out there on the web today — we've also posted a photo from Bruce's 50th on our Facebook page you'll wanna see, and Blogness, as usual, does a good job of rounding those things up; be sure to check out their list of links including some dreamshows from Stan Goldstein at NJ.com, and Instagram greetings from Tom Morello (sez "More badass than ever at 65") and Patti Scialfa. Backstreets, meanwhile, is on the road for the occasion — up in New Jersey for tonight's special birthday celebration at Monmouth University, An Evening With Thom Zimny. Come join us there for a conversation between Bruce's film archivist/collborator and Backstreets' Chris Phillips, along with plenty of treats from deep down in the vaults that Thom is bringing to share with us on the big screen. We promise it'll be worth dealing with Jersey traffic on a school night... we'll even have cake! AUTHORS, SCHOLARS AND FANS DISCUSS, DEBATE AND CELEBRATE "FIFTY YEARS OF MAKIN' THIS GUITAR TALK"
Today's 65th-Birthday Boy is a college dropout who's often sung the praises of learning more from three-minute records than from school. Not exactly the typical candidate for an all-day university forum centered around his achievements (let alone three previous multi-day symposia at the same university in 2005, 2009 and 2012.) This particular dropout is named Bruce Springsteen, however, and approximately 200 folks who've written about, studied and/or drawn enjoyment and inspiration from his music gathered together this past Saturday in celebration of another very significant anniversary: the passage of fifty years since Springsteen took his first serious steps, in July of 1964, to begin his life as a musician. 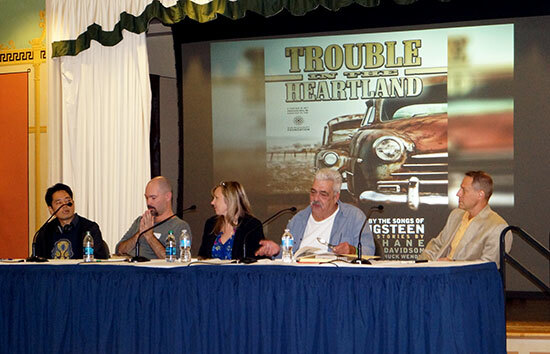 The sixth panel offered the audience a sneak-preview of the forthcoming anthology Trouble in the Heartland: Crime Fiction Inspired by the Songs of Bruce Springsteen, including some of the contributors reading selected passages from their stories and a display of the book's photo-insert Photographs on the Edge of Town by Mark Krajnak. Stay tuned to Backstreets.com for more information about this anthology as its official publication date draws closer. Audience members also had time to meet one-on-one with panelists and moderators, buy books (including exclusive advance copies of Trouble in the Heartland) and get them signed by authors. Lunch in beautiful Wilson Hall was complimented by live performances of Springsteen classics by some of Monmouth University's finest music students, under the direction of Monmouth University's Music Industry Program Director Joe Rapolla. (Their brief concert included a great punk-rock version of "Born to Run", a true highlight of the day.) Friends' Executive Director Melanie Paggioli closed the forum with a promise that the Friends will continue to organize special events like it further on up the road. Indeed, the very next one will happen tonight, in celebration of Bruce's birthday, featuring his longtime film archivist/collaborator Thom Zimny bringing some treasures from the vault for a rare screening/conversation (with Backstreets' own Chris Phillips) in Monmouth University's Pollak Theatre. If you haven't bought your tickets yet, click here or phone 732-263-6889, and we'll hope to see you tonight. 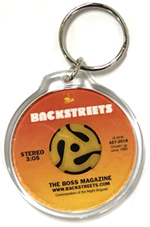 Of course we know that tomorrow, September 23, is a particularly special day in Boss history. 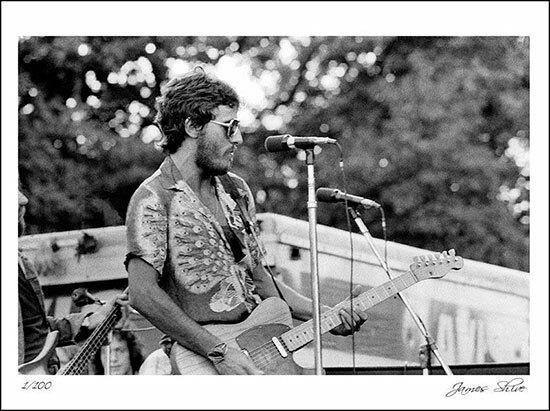 But here on birthday eve, let's mark another anniversary — 40 years ago, on September 22, 1974, Bruce Springsteen and his new-model E Street Band played on the lawn at Kean College in Union NJ. 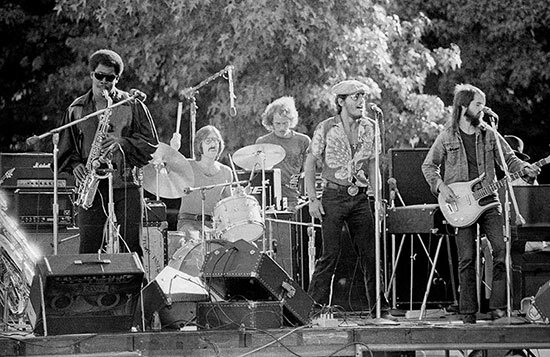 This outdoor concert yielded the first known audio recording of the new lineup, as well as the first photos of a Springsteen concert showing rookies Max Weinberg and Roy Bittan in the band. Photographer James Shive was there with his camera and captured these images. The shot below has never been seen before, and Shive is offering it now as a limited 16" x 20" print from the Shive Archive in an edition of 100. Bruce and the band opened that show with "Spirit in the Night": "Singin' our birthday songs..."
Country music superstar and legendary session musician Glen Campbell is the subject of a new documentary, I'll Be Me by James Keach (Walk the Line) and Trevor Albert (The League of Extraordinary Gentlemen). The documentary centers around the legendary singer/guitarist and his struggle with Alzheimer's, which he was diagnosed with in 2011. Bruce Springsteen was interviewed for the documentary, and he appears in the trailer above, along with The Edge and Chad Smith from the Red Hot Chili Peppers. Campbell began his career as a session musician in Los Angeles, recording with artists as varied as Nat King Cole, Merle Haggard and the Monkees. In 1964, he landed a four-month gig as the touring bassist for the Beach Boys, replacing Brian Wilson, who wanted to focus on recording. 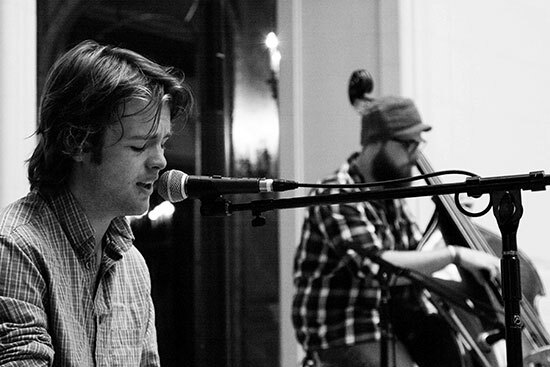 Campbell hit paydirt as a solo artist with his recording of John Hartford's "Gentle On My Mind," and Jimmy Webb's "By the Time I Get to Phoenix." In 1968, another of Webb's songs, "Wichita Lineman," and "I Wanna Live," gave Campbell two more smashes on the Country charts that effortlessly crossed over to Pop radio. In 1969, Campbell became a familiar fixture across America via his television series, The Glen Campbell Goodtime Hour, a program that cemented Campbell's reputation as an entertainer to be reckoned with. The show featured a variety of superstars of the day, including Stevie Wonder, Johnny Cash, Neil Diamond and Bread. Campbell's career high, however, was yet to come. In 1975, he released the single "Rhinestone Cowboy," a mega-hit with which he will forever be associated, that went to number one on Billboard's Hot 100 and Hot Country charts. In 2008, Glen, by now a member of the Country Music Hall of Fame, released the Meet Glen Campbell album, a collection of covers by contemporary acts like the Replacements, U2 and the Foo Fighters. The album was met with critical acclaim, and a follow up, Ghost On the Canvas, was announced. Two months before Ghost on the Canvas was released, Campbell revealed that he had been diagnosed with Alzheimer's disease, and that the tour to support the album would be his last. The album's title track (written by former Replacement Paul Westerberg, who also appears in the video) was released as a single, and Glen's farewell tour was extended until 2012. 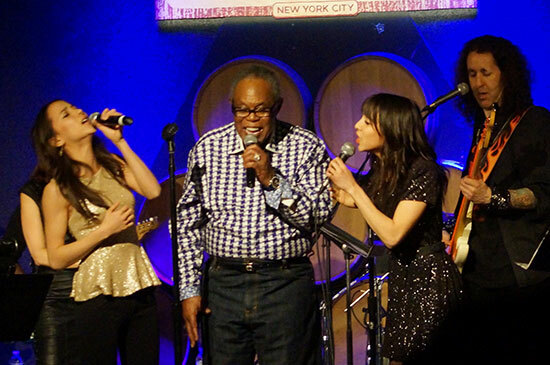 Campbell gave his last performance on November 12 of that year. I'll Be Me opens in theaters on October 24. This weekend in New Jersey, Boss birthday festivities begin — and in addition to celebrating Springsteen's 65th birthday, we're also marking his 50-year milestone as a musician. As Bruce says in the clip above, "I've been doing this [as of July 2014] for 50 years. Feel like I've just started, man! I've got another 50 in me." 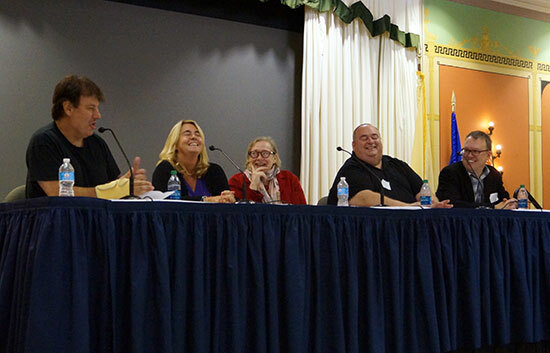 On Saturday, a host of authors, scholars and DJs will convene at Monmouth University for an all-day forum, 50 Years of Makin' This Guitar Talk, sponsored by Monmouth U and the Friends of the Bruce Springsteen Special Collection. See the full agenda here, with panelists including Backstreets' own Chris Phillips and Shawn Poole. Tickets still available here. We hope to see you there! And just a few days later, on Bruce's actual birthday (Tuesday, September 23) we'll back at Monmouth U for An Evening With Thom Zimny, where Bruce's film archivist will be bringing a bunch of treats to show on the big screen along, with Phillips moderating some Q&A onstage at the Pollak Theater. Come one come all! If you're anywhere near North Carolina's Triangle area, come join Backstreets editor Chris Phillips this evening for books, beer, and Bruce. McIntyre's Books in Fearrington Village is sponsoring a new "Books & Beer" authors series at the local beer garden, Roost, and Phillips is this week's special guest. No readings... just hanging out, drinking beer, and shooting the breeze — which in this case will mean a whole lot of Bruce talk. 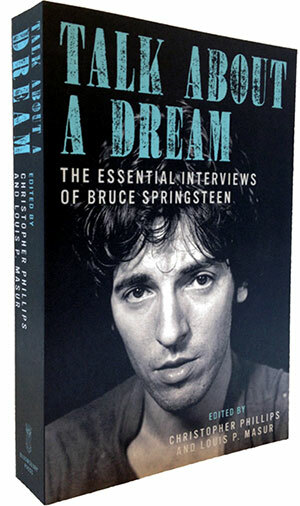 McIntyre's will be selling copies of Talk About a Dream: The Essential Interviews of Bruce Springsteen, which Phillips edited with Louis Masur and will be signing from 5 to 8pm. It's shaping up to be a beautiful night, come hoist a pint or two. Click here for more details. If you can't make it to Roost tonight, Talk About a Dream is available signed from Backstreet Records, and we ship anywhere in the world. The 450-page book collects 40 years of interviews with Springsteen. Garry Tallent calls it "a must-read for all serious Bruceaholics"; Nils Lofgren says, "No artist has ever been as candid, informative, and entertaining as Bruce is in this wonderful book... I highly recommend it." Erin Keane's new poetry book, Demolition of the Promised Land, is a modern, rhythmical collection of work about love and loss and life, mixed together with settings in the South, with Nashville and Memphis, and there is heartbreak and there is sadness and there is joy. It is a lovely body of work. There are also nine poems about Bruce Springsteen. That's right, the title reference is not accidental. Keane characterizes Bruce's role in this anthology as "guide, ghost and accidental guru." They are not so much about Bruce but use him as a spirit animal, as a device, or even as a deus ex machina. Bruce is in the supermarket, he is in the Pine Barrens, he is visiting Washington D.C. He is a mythical figure, a flight of fancy, a theme. You would think this wouldn't work or would be so distracting that they would take the reader out of the poem, but it does not. The poems are serious, delightful, fantastical and heartbreaking. Don’t get me wrong; this is not fanfic, nor is it meant to be ironic. Without the Springsteen-related poems, Demolition of the Promised Land, Keane's third volume of poetry, would still be an engaging, emotive collection of work. Backstreets spoke with Keane via email. When did you write your first poem about Bruce? Can you talk a little bit about what inspired it? I started writing the Bruce poems in 2011. I had been listening to Darkness on the Edge of Town on repeat and I found myself delighted and fascinated by how he pronounces the word dream, which made me start to think about how malleable Bruce's accent is when he sings. Sometimes he has a real Southern accent. Doesn't he sound a little like a lost Pogue in "Death to My Hometown"? I was born in New Jersey, and my family moved around a lot until we settled in western Kentucky, where my mother's mother was born. My own accent changes and shifts depending on where I am, who I'm with, and my emotional state. I started thinking about how Bruce Springsteen reminds me of both of my hometowns, and why. Which poem was first? Did you then make an effort to "find" more or did they just keep presenting themselves? So the first poem in the series was "The Dream and What Follows," and then I just started thinking about Bruce as a character who both is and is not the Bruce Springsteen we know as a public figure — he became a sort of super hero, a guide to America with a lot resting on his shoulders. The Bruce character kept finding opportunities to insert himself into the landscape. One of the next poems I wrote in the series is "Outside Atlantic City," where he shows us around his secret hide-out, which is about as secret and subtle as a giant elephant-shaped building right off the beach could possibly be. The fact that Lucy still exists on the shore and is cared for is a miracle, and I wanted her to be doing something more than just existing. When did you realize this was starting to become a theme, and how did it make you feel? When did you make the decision that he was going to be the "spirit animal" (as you mentioned to me) of this particular poetry collection? I started writing the poems in this collection in 2007. I had just finished what became my second book, Death-Defying Acts, and that was a collection of persona poems in the voices of circus performers. I wanted to go back to writing in my own voice and see how it had changed. While I was writing, three friends died unexpectedly, pretty much one right after another. My father died when I was five, and during all of that, the central question of the poems in this book became how do you continue to love and form attachments to men if they just disappear? Enter Bruce in 2011, who could function as a foil and a role model and an accidental guru of sorts. Someone substantial who could confront the terrifying instability of the daily world with a sense of purpose and courage. You mention that you didn't love Bruce until you turned 30. What was your relationship to his music prior to that time and how would you characterize it now? I had kind of written him off as dad rock with a couple of dopey big '80s hits because I was a snotty know-it-all little punk with an attitude about such things. Well, Nebraska was all right. I preferred New Wave and what did they call it, college rock? from the '80s, as well as bands like The Clash and The Stooges, plus all the grunge from my high school years, that sort of thing, and a certain amount of sad-sack alt-country. And all of that, I still love. But around the time I turned 30 I had a little more life experience under my belt and I started to appreciate Springsteen's genius in a way that I didn't have the skills or maturity to understand before. I began to really appreciate how he can locate joy inside of painful stories, and how much dignity he gives the losers in his songs. And his optimism — he doesn't indulge in nihilism or petty self-destruction. And most significantly, he's not self-indulgent about his anger. Listening to a Springsteen song is a lot like listening to good Memphis soul — it feels like church, and I guess I was ready to start going back to church. I'm not an encyclopedic super-fan, but I am a strong enthusiast. And "Atlantic City" is one of a handful of songs that's guaranteed to make me cry every time I hear it. It's pretty much my "Danny Boy." You have an obvious relationship and affinity with musical landmarks as demonstrated with your familiarity with Memphis and Nashville in the book. Have you been to the Jersey Shore? If so, did it meet your expectations? So, I was born in New Jersey. My parents moved from downtown Manhattan to Jersey City right before I was born. Even though we moved away, my brother and I would go visit family in the summers, and we always spent time down the shore. So I don't even know it as a musical landmark in the same way I know Nashville and Memphis — I know New Jersey on a DNA level. The funny thing is, Kentucky and New Jersey seem like they would have nothing in common, but they are both deeply misunderstood states whose beauty is often undersold and whose inherent weirdness is consistently undervalued. I haven't been to Asbury Park, though, and I suspect it will feel like a real pilgrimage when I do. 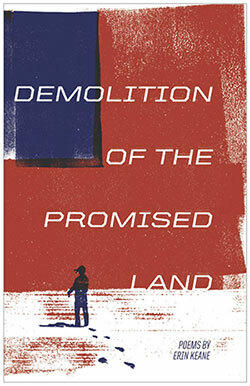 Demolition of the Promised Land is published by Typecast Publishing and is available now from Backstreet Records. The angels are shouting "Glory hallelujah..." Hope you have a great one. A fan of Bruce Springsteen? Also a fan of corny dirty jokes? Once again, the two come together again for a great cause, the 2014 Stand Up For Heroes benefit for the Bob Woodruff Foundation. Springsteen joins a November 5 bill at the Theater at Madison Square Garden that also includes Louis C.K., John Mulaney, John Oliver, and Brian Williams. Now in its eighth year, Stand Up for Heroes has raised more than $21 million in funds to help post-9/11 injured service members and their families thrive long after they return to the home front. Tickets go on sale tomorrow, Wednesday September 17 at noon EST, via Ticketmaster. Last year, there was a live stream from the performance; we'll keep you posted if and when we hear of anything similar planned for this year. To celebrate Bruce's 65th birthday, the Friends of The Bruce Springsteen Special Collection and Monmouth University will be hosting an exciting evening of films presented by his archivist and collaborator Thom Zimny. 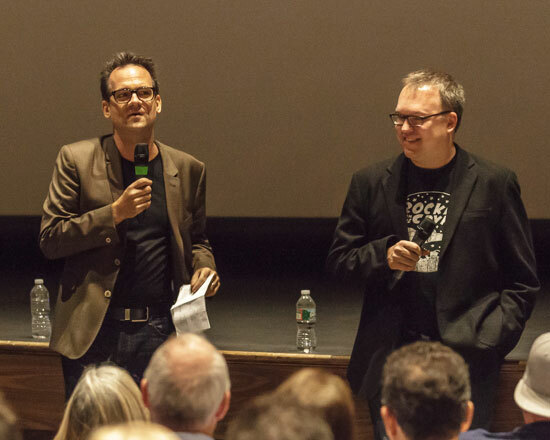 On Tuesday, September 23, Zimny will be bringing a reel of footage from the vault to show on the big screen, as well as participating in a Q&A with Backstreets editor Christopher Phillips on the stage of Monmouth U's Pollak Theater. Click here for more information on An Evening with Thom Zimny. Click here to order $20 tickets for An Evening with Thom Zimny ONLY or, better yet, order by phone at 732-263-6889 to score the combo-ticket deal. For just $35, you'll get to attend both the 9/23 Thom Zimny event and Fifty Years of "Makin' This Guitar Talk" (lunch included) on 9/20. 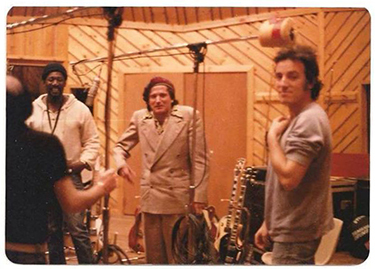 For an advance taste, we've revisited a conversation Zimny had this summer on E Street Radio, focusing on the "Hunter of Invisible Game" film he made with Springsteen. Over the course of the July 16 show with host Dave Marsh, Thom gave a good deal of background on the short film; if you missed that broadcast, we've taken the liberty of editing his comments into a piece that gives you more insight into the film Bruce called "one of our best." YANKEE DOODLE, KEEP IT UP! Still, there are worse things to do with your summer vacation. 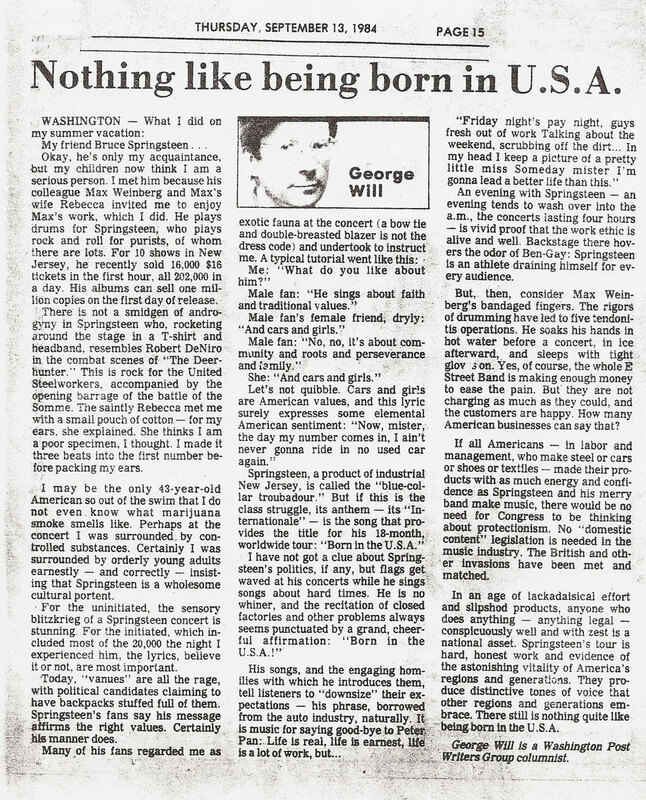 Click the article above for a larger version of Will's full column, also published under the titles "Bruce Springsteen's U.S.A." and "A Yankee Doodle Springsteen" 30 years ago today. TAKE THE SHIRTS OFF OUR BACKS: EVERY TEE IN STOCK ON SALE! It's not often we need to do inventory reduction... but we're drowning in shirts over here at Backstreet Records. The new Staff T-shirt just arrived (SuperSubs, we're folding them up now, yours will be on its way to you soon), and those stacks have pushed our shirt shelves past the tipping point. Help us make room, wouldja? For the next week, we're offering 15% off every shirt in stock. From official concert wear to Backstreets tees and beyond, we've got 20 different Boss shirts available (and not all of them are black). Click here to view the full selection. Use coupon code TEE15 to apply the discount at checkout, which will take 15% off all shirts in your cart. While they last... sale ends September 17. Please note: 15% off sale applies only to sizes still in stock. As sizes sell out, they may be gone for good, or at least not available for backorder at the sale price. Also, we're still taking orders for Danny Clinch's forthcoming book of rock photography, Still Moving, for which Bruce Springsteen wrote the foreword. Danny is still hand-signing all pre-orders for our customers. Feel free to combine an order for Danny's signed hardcover with a shirt order to save on shipping; just be advised that products will mail together when Still Moving is realased September 23. 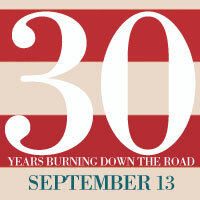 Individual tracks from the forthcoming Born in the U.S.A. tribute album have premiered on various websites in recent weeks, including "I'm Goin' Down" right here on Backstreets.com. Starting today, a week before the album's September 16 release, you can hear the entire thing online. Visit Time.com for the full album stream. Dead Man's Town: A Tribute to Born in the U.S.A. comes out a week from today, and you can order yours now from Backstreet Records for immediate shipment upon release — we're taking pre-orders for both the CD and the vinyl LP. GOT ON HIS DEAD MAN'S SUIT? 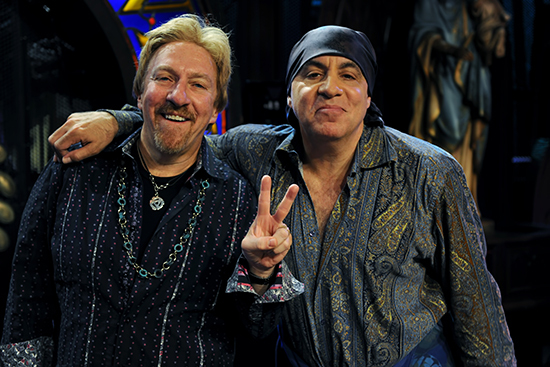 For years, fans wondered if Stevie Van Zandt might get his old friend Bruce to join him on The Sopranos. That ship, of course, has sailed, but it looks like Frank the Fixer will have the tellyvision rendezvous that Silvio Dante never got to enjoy. 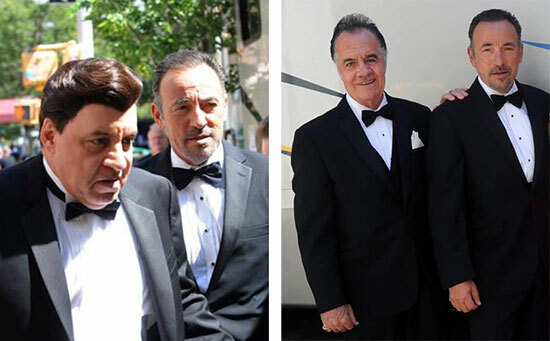 Nellie Andreeva reports Lilyhammer Season 3 buzz on Deadline.com: "I hear Van Zandt’s The Sopranos co-star Tony Sirico has joined the upcoming third season in a recurring role, and Van Zandt's longtime E Street Band mate Bruce Springsteen will be making a guest appearance." According to the Deadline story, filming has taken is taking place in New York. Peter Wallace, of Lilyhammer's home network, Norwegian TV channel NRK, has confirmed with Dagbladet today that Springsteen does indeed play a part in the next season, to air later this year on NRK (as well as Netflix in the U.S., date not yet announced). Wallace does not describe Bruce's actual role — Andreeva hears that Springsteen will "play the owner of a mortuary" — but states that he'll appear at the end of the season [translated from the Norwegian]: "Bruce and Steven both wanted to make this happen, which we think is great, but it has taken some time. So this came at the end of filming [for Season 3]." Springsteen previously appeared as himself in a High Fidelity cameo and of course showed his acting chops in music videos from "I'm on Fire" and "Glory Days" to the recent "A Night With the Jersey Devil" and "Hunter of Invisible Game." 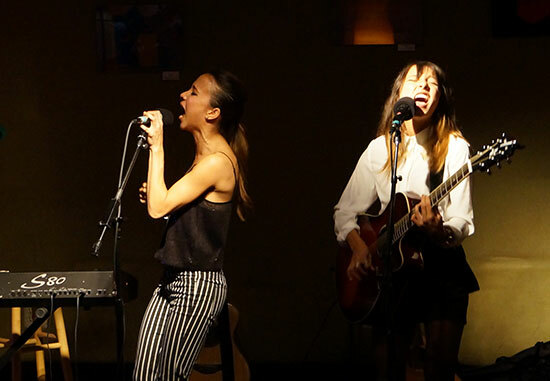 Nalani & Sarina are two young, smart and extremely talented musicians — and Springsteen fans — hailing from Phantom Dan Federici's hometown of Flemington, NJ. The identical twins, newly turned 21, are singers and multi-instrumentalists who write, record and perform their own songs together, "bring it" live on stage, and have consciously avoided many of the music business pitfalls that would compromise their artistic visions. The interview was conducted in anticipation of their recording a beautiful cover of Springsteen's "Save My Love" as an exclusive Backstreets.com download. Next week, Nalani & Sarina will perform with a full backing band at the legendary New York club The Bitter End, where they've been maintaining a monthly residency. This will mark the first time they'll get to deliver live versions of selections from their debut full-length CD, Lessons Learned, with the same full-band sound in the recorded versions. The first-rate band will consist of drummer Jim Hines (John Legend, Brian Wilson, etc.,) bassist Will Lee (CBS Orchestra, The Fab Faux, etc.,) keyboardist Tommy Mandel (Bryan Adams, Dire Straits, Everett Bradley's Holidelic, etc.) and ace guitarists Oscar Rodriguez and Leni Stern. Click here for details, and visit nalanisarina.com for more show dates and information. 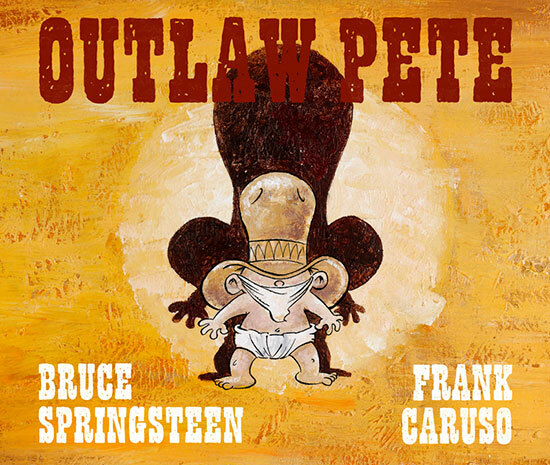 From the Backstreets.com audio archives, click here to hear Frank Caruso, illustrator of the upcoming Outlaw Pete picture book, in an early discussion of the project during a segment of E Street Radio's Live from E Street Nation with Dave Marsh originally aired on May 18, 2012. 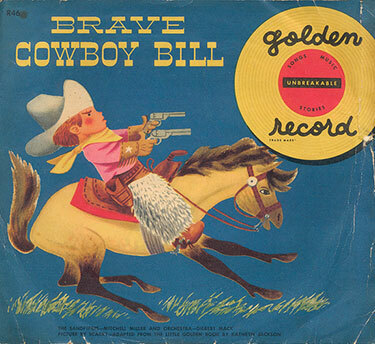 For more Outlaw Pete-related audio, click here to hear both sides of the 1950 Brave Cowboy Bill vinyl children's record, recorded by Gilbert Mack & The Sandpipers with orchestration conducted by Mitchell (aka Mitch) Miller) and based on the 1950 Little Golden Book that inspired Springsteen's song "Outlaw Pete." 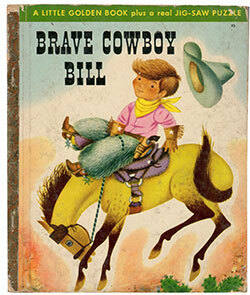 Both the Brave Cowboy Bill book and the Brave Cowboy Bill record sleeve featured illustrations by the late, great children's book author/illustrator Richard Scarry. Over the years, Backstreet Records has worked to bring you signed copies of numerous Springsteen-related books, thanks to the kindness of authors including Clarence Clemons, Peter Ames Carlin, and Eric Meola (signed copies of Bruce books by Debra L. Rothenberg and Christopher Phillips are still available in our shop). Here's the next one: Still Moving, a beautiful new book of more than 200 striking photographs of musical greats, as captured by Danny Clinch. 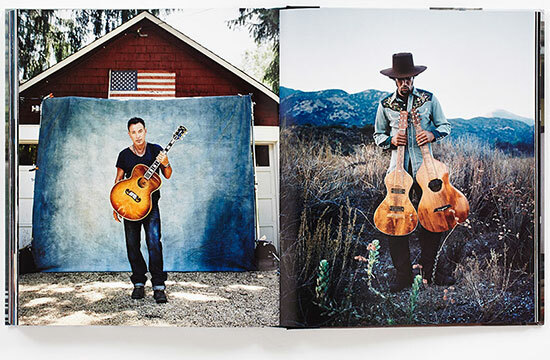 Danny has been one of Bruce's go-to photographers for well over a decade (including the album covers for The Rising, We Shall Overcome, Wrecking Ball, and High Hopes), and Springsteen is one of the many artists represented in this lavish, 300-page hardcover monograph from Abrams Books. Springsteen also wrote the foreword. Danny has kindly agreed to autograph copies for us, for all Backstreets customers who sign up for a copy now. 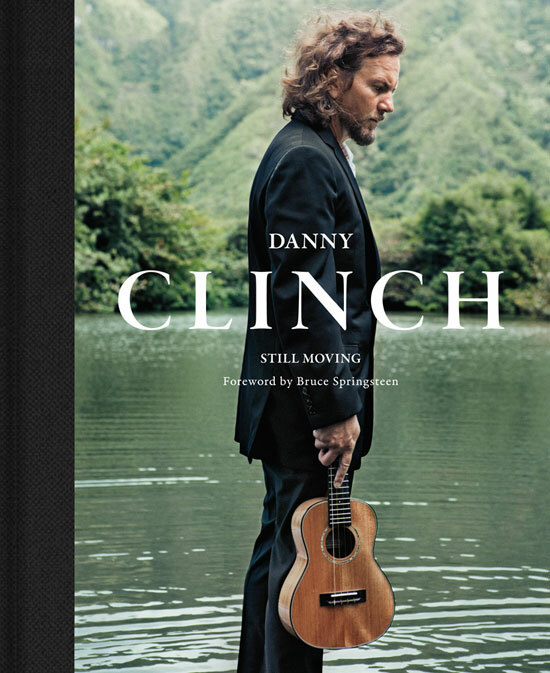 Still Moving is due out on Bruce's 65th birthday, September 23, so the window is tight... Danny may be signing for us as early as next week... but you can pre-order now to guarantee your copy signed by author/photographer Danny Clinch. From Friday through Monday at 12 and 8pm each day, E Street Radio also will air complete recordings of some of the best concerts of the tour, beginning with a re-airing of the remastered Apollo Theater show (March 9, 2012) at 12pm on Friday and ending with the final show of the tour in Uncasville, CT (May 18, 2014) at 8pm on Labor Day. Finally, each hour throughout Labor Day Weekend you'll hear songs from the Wrecking Ball/High Hopes Tour, preceded by special clips from Springsteen’s various E Street Radio interviews about the tour and his two most recent albums. Catch it all on Sirius/XM channel 20. "I Was Made For Lovin' You" never became a picture book, so score one for Bruce. In the vein of Bob Dylan's Forever Young, Simon & Schuster has announced Outlaw Pete, an illustrated book by Bruce Springsteen and Frank Caruso based on the Springsteen song, due for publication on November 4. Both the song (from the 2009 Working on a Dream album) and the new book Outlaw Pete were inspired by a children's book, Brave Cowboy Bill (Simon & Schuster, 1950), which Bruce Springsteen's mother used to read to him as a child. "Outlaw Pete is essentially the story of a man trying to outlive and outrun his sins," Springsteen writes. Caruso, a cartoonist and writer, conceived of making the song into a book and created the illustrations to accompany Springsteen's lyrics. "When Bruce wrote 'Outlaw Pete' he didn't just write a great song, he created a great character," Caruso said. "The first time I heard the song this book played out in my head. Like Tom Sawyer, Huck Finn, Dorothy Gale and for me, even Popeye, 'Outlaw Pete' cuts deep into the folklore of our country and weaves its way into the fabric of great American literary characters. " Dave Marsh writes, "Outlaw Pete is an adult book, illustrated by Frank Caruso, who drew and painted its pages. Caruso does more than illustrate the song. His approach, immaculately detailed, simple when it needs to be, parallels Springsteen's blend of absurdity and meditation.... Details that pass by almost unnoticed in the lyrics become central. Reading and listening have rarely so superbly complemented each other." Outlaw Pete will be available in both hardcover and ebook formats, November 4. Next month, Monmouth University in West Long Branch, NJ, home to the Bruce Springsteen Special Collection, will host three interrelated happenings with a Springsteen theme. In addition to the previously announced Barry Schneier photography exhibit opening September 2, the university will co-host two events around Bruce's 65th birthday: a daylong discussion forum, and a film presentation by longtime Springsteen collaborator Thom Zimny. Both events will be presented in collaboration with the Friends of the Bruce Springsteen Special Collection. The forum, titled Fifty Years of "Makin' This Guitar Talk," is scheduled for September 20, and will feature moderated discussions focusing upon various aspects of Springsteen's 50-year artistic journey. Panelists are set to include a variety of journalists and academics as well as photographer Schneier and Bruce Brunch host Tom Cunningham. On September 23, filmmaker and Springsteen video archivist Thom Zimny will employ the state-of-the-art projection system at Monmouth's Pollak Theater to present An Evening With Thom Zimny, including a selection of clips from the vault. Tickets may be purchased individually for $20 or $35 for both events, and go on sale today, August 28, at 10am through the Monmouth University box office. Call 732-263-6889 or visit the box office website for ticket sale information. Click here for more information on the events themselves. Proceeds from all sales will benefit Monmouth University and Friends of The Bruce Springsteen Special Collection. Over the weekend, Springsteen was revealed as #17 of "CMT's Top 40 All-Time Artists," just ahead of Bob Dylan. The Top 40 is "a list of the most influential artists in history chosen by country stars themselves." We had a sneak preview last week, with some extended quotes from country artists singing Bruce's praises; Steve Earle said, "I don't think there's any argument about this: He's the greatest performer — and I'm talking about Elvis Presley, James Brown — Bruce Springsteen is the combination of all that and the greatest live performer that rock 'n' roll, or pop music of any sort, has ever produced." Here we've got some additional bonus material from CMT, more Bruce talk with some of the artists who took part in the poll, including Jennifer Nettles, Rosanne Cash, the Oak Ridge Boys, Dierks Bentley, and Keith Urban. On Friday evening, the Count Basie Theatre in Red Bank, NJ presented its inaugural Vanguard Award to Steven and Maureen Van Zandt. The pair was introduced by their friend Rich Russo, host of the syndicated Anything, Anything program. Also receiving the award were Monmouth Arts Executive Director Mary Eileen Fouratt and Lillian Burry, Director of the Monmouth County Board of Chosen Freeholders. 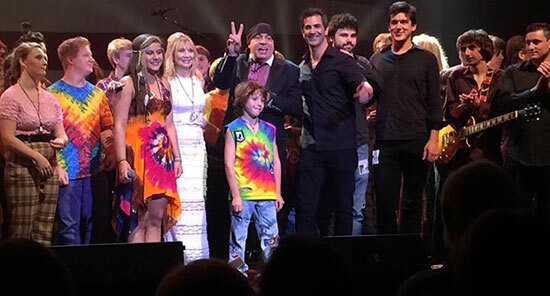 The Van Zandts received the award during the performance of "A Tribute to Woodstock & The Age of Aquarius" by Rockit!, a collaborative of musicians who are part of the ongoing music instruction project hosted by the Basie. Steven and Maureen curated the show, dropping by during rehearsals to offer assistance and guidance on costumes and choreography. Maureen spoke first, invoking the spirit of Jimi Hendrix before turning the mic over to her irrepressible husband, who commented modestly that both of them were there primarily to support the Rockit! Program. "The rock era has ended, and I miss it," said Steven, who commented that programs like Rockit!, which employs curricular materials from the Van Zandts' "Rock and Roll: An American Story" social studies curriculum, are a key ingredient to a well-rounded education. Being in a band teaches important life lessons like compromise, persuasion, and working toward a common goal, he said. "You can learn about life from being in a band." Although the night truly belonged to the youngsters, hopes were high throughout the proceedings that Mr. Van Zandt would return to the stage, and he did not disappoint, unassumingly joining the assembled performers in full sidekick mode for a set-closing "With a Little Help From My Friends," to which he contributed guitar and backing vocals. In his opening speech, Count Basie Theatre CEO Adam Philipson stated that the "American Story" curriculum would continue to be a part of their ongoing Rockit! instruction, and that so far it has been a great success. The program, developed by the Van Zandts in conjunction with their Rock and Roll Forever project, is set to launch in Steven's hometown school district of Middletown, NJ in a few weeks. "CMT's Top 40 All-Time Artists," a list of musical greats as voted by a large panel country musicians, is being revealed an artist at a time, one each week, as part of their "Hot 20 Countdown." Heading into this weekend, we've got word that Bruce Springsteen is the new man of the hour. A network rep tells Backstreets, "The 'Top 40' list was determined by the country music artists who were interviewed: who did they think belonged there, and why? As you might imagine, plenty of country music icons made the list, but some pop and rock legends are there, too, like Bruce." Above, a taste of the segment on Springsteen that will run on CMT this weekend, including some extended interview soundbites that you'll only get here. The clip includes Boss testimonials from Rosanne Cash, Steve Earle, the Oak Ridge Boys, Jennifer Nettles, Keith Urban, Kip Moore, Mary Chapin Carpenter, and Dierks Bentley. Cash says: "He just keeps his head down and shows up for work. And his work happens to be one of the greatest bodies of work that we have in American music." Tune in to the "CMT Hot 20 Countdown" Saturday, 8/23, at 11AM Eastern/Pacific, 10 Central, repeating at the same time on Sunday. The Springsteen segment, roughly five minutes, will most likely be in the last hour of the three-hour show. Thanks to our friends at CMT for the sneak peek. STEVIE-BRUCIE PRODUCTIONS: CAN WE GET AN AMEN? Tomorrow night in Red Bank, Steven and Maureen Van Zandt will be honored with the Count Basie Theatre's Vanguard Award, for their "lifelong devotion to the arts in New Jersey." Chris Jordan spoke with Stevie for the Asbury Park Press, discussing his Rock and Roll Forever school curriculum, the various configurations of the E Street Band, and more. Our favorite quote from Steve, after Jordan mentions his production on Darkness, The River, and Born in the U.S.A.: "Maybe one more time before we check out, it would be fun to produce another Bruce Springsteen record in whatever configuration the band is in... One more Stevie-Brucie production together." 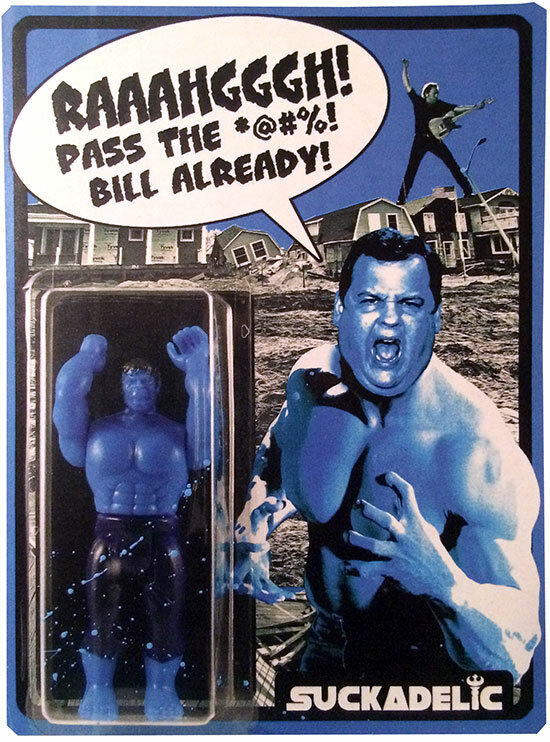 Haven't had enough of Chris Christie on Springsteen? From the Star-Ledger, here's video of a town hall event this week where the NJ governor was asked about using Bruce's music at his events. As the #icebucketchallenge takes social media by storm, raising awareness (and lotsa money, we hope) to fight ALS, it was only a matter of time before some high-profile dumpees issued the challenge to Bruce. Above, Eddie Vedder picks up the gauntlet thrown down by Pearl Jam bandmate Mike McCready and passes it along to the Boss — "I know he's just waiting to be challenged, as usual" — along with Tim Robbins and One Direction's Niall Horan. Below, Eric Church accepts the challenge from Keith Urban, takes a John Deere load over the head, and "swings for the fences" by nominating Bruce along with George Strait and James Hetfield. To help #strikeoutALS, we also point you to the Joan Dancy and PALS Foundation, formed by Terry Magovern in 2005 in honor of his late fiancé, working to improve the lives of ALS patients and their families in Monmouth & Ocean Counties. Update: Pat Riley also challenged Bruce right before taking a bucketful over the head. Kathleen Edwards is a phenomenal singer-songwriter — we're partial to her Asking For Flowers album, and her duet on "Golden State" with John Doe, but you can really start anywhere. She's a great interpreter, too, as evidenced by this new cover of "Human Touch," just posted to Soundcloud. (If you're an R.E.M. fan, stick around for her recording of "Sweetness Follows," too.) Enjoy. After several successful symposia at Monmouth University, Springsteen scholarship has finally received the regular outlet it deserves. 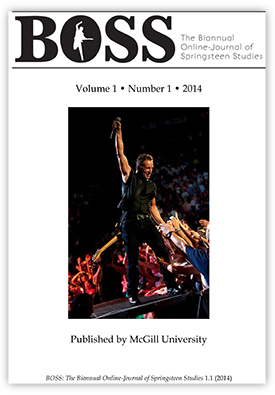 In January of this year, editors Jonathan D. Cohen, Roxanne Harde and Irwin Streight began soliciting material for a new academic journal titled BOSS, the Biannual Online-Journal of Springsteen Studies, and the first issue has just been published in PDF form. The mission of the open access journal, which is published by the McGill University Library, is "to encourage consideration of Springsteen's body of work primarily through the political, economic and socio-cultural factors that have influenced his music and shaped its reception." Cohen tells Backstreets, "Our journal — which is free and will be publicly available on our website — is oriented towards both academics as well as casual fans interested in reading scholarly writing on Springsteen." 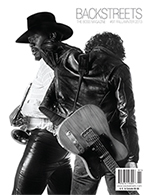 Each issue of BOSS will contain several academic articles and book reviews and will highlight a particular special collection that may be useful to Springsteen scholars. The publication is freely available to all users, and potential contributors may submit editorials, articles or reviews via the online interface. Per standard practice for academic journal publication, all submissions are peer-reviewed; experts in the field evaluate work for quality of scholarship and research methodology as well as accuracy, thus ensuring that all material published in the journal meets academic community standards. Highlights of the current issue include William Wolff's "Springsteen, Tradition and the Purpose of the Artist," which examines Bruce's role in an ongoing artistic tradition, and a penetrating review of the recent fan-based film Springsteen & I.
Singer-songwriter Ryan Bingham showed up on our radar with his work on Crazy Heart ("The Weary Kind" won an Oscar and a Golden Globe), and again with his Joad tour-esque theme for FX's The Bridge, "Until I'm One With You." Here, he hops aboard the Coast City bus to "Atlantic City." We were very saddened by the news regarding the apparent suicide of beloved comedian and actor Robin Williams. Williams was a fan and friend of Bruce Springsteen since the '70s — Dave Marsh's Born To Run: The Bruce Springsteen Story features the story of Williams arriving to visit Springsteen at his New Jersey home just as Bruce's April 1979 motorbike accident occurred. 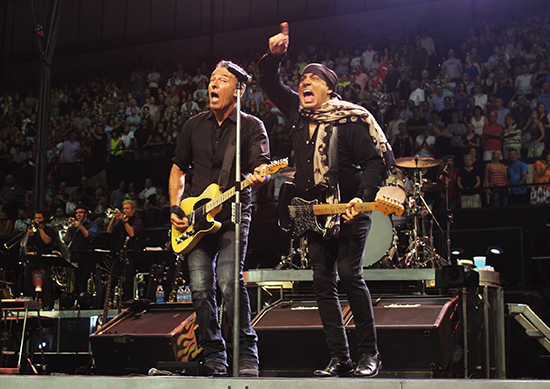 They also performed on the same bill for the original Bridge School benefit in 1986 and the 2012 "Stand Up For Heroes" concert; Williams enthusiastically introduced Bruce and the E Street Band at the Grammys in 2003 (above). And of course, there's Williams' still-hilarious bit "Elmer Fudd Sings Bruce Springsteen," from his 1983 television special An Evening with Robin Williams (also released in audio-only form on the out-of-print album Throbbing Python of Love and as one side of a rare 12-inch vinyl promo single.) It's a brief reminder of the immensely talented person we've lost all too soon. Backstreets.com extends our deepest sympathies to all who knew and loved Robin Williams. May he rest in peace. 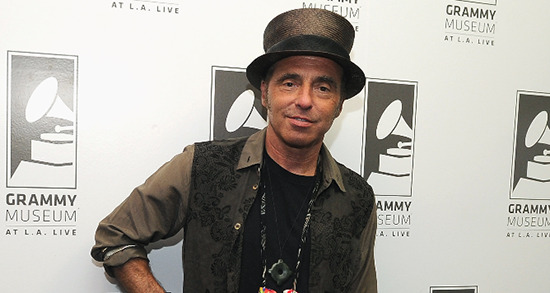 Nils Lofgren marked the release of his fine new career-spanning box set Face the Music Tuesday night with a special appearance at LA's Grammy Museum – part of its "An Evening With" public program series. Since the Clive Davis Theater holds 200 people, this was a rare treat to see the master guitarist in an intimate setting. The sold-out event ran just under two hours and included six acoustic performances. Hosted by Scott Goldman, Vice President of The Grammy Foundation and MusiCares, the wide-ranging interview began with Lofgren describing his 18-month "labor of love" journey "turning the house upside down" to unearth old tapes for Face the Music. Among the 40 previously unreleased box set tracks and rarities, the veteran musician considered a version of "Keith Don't Go" (one of Lofgren's signature tunes featuring Grin, plus Neil Young on piano and backing vocals) as the compilation's "piece de resistance." Although Lofgren said he tends to ramble, he shared plenty of fascinating and humorous anecdotes, including meeting and observing many idols playing around Washington DC-area clubs like The Cellar Door and The Apple Pie. "I was a non-threatening, waifish teenager. I felt compelled to sneak backstage and ask advice of musicians" like Muddy Waters, Tim Hardin, Roy Buchanan and others. Unlike people who can spend months and years in the studio, Lofgren said that method is not for him: "I sing my heart out, record it and move on." After doing the fast-paced, folky "You" on acoustic guitar at the museum (the box set version has Young on harmonica and vocals), Lofgren talked about how making Tonight's the Night with Crazy Horse was a completely live and anti-production project. "Neil didn't want us to learn the songs too much," he said, to much audience laughter. While working with Bob Ezrin on 1979's Nils LP, the producer suggested a collaboration with Lou Reed. They met and found a shared affinity for football. Lofgren said he sent over several music ideas and eventually Reed penned lyrics to all of them and proceeded to dictate the results over the phone at 4 a.m. one day. Then Lofgren performed "Life" — one of the pair's collaborative songs that includes sax work by Branford Marsalis on the box set. It was prefaced by an intricate guitar intro Lofgren first wrote as an addition to the live "Counting on a Miracle" with the E Street Band. Back in the day, Grin and Steel Mill used to play the same live circuit and even auditioned for a gig at Bill Graham's Fillmore West together. Lofgren recalled how he and Springsteen had a distant friendship over the years. 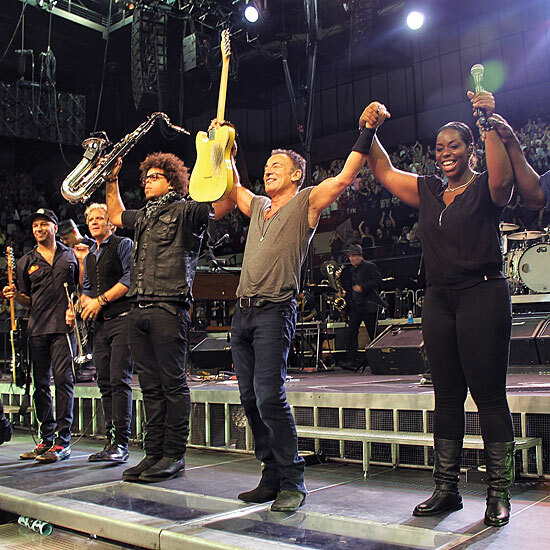 When Bruce phoned him up in 1984 amid a low career period to hang out in LA and then play with the E Street Band at Clarence Clemons' club in Red Bank, it was something of a no-brainer to "cancel my life and go learn 400 songs." Goldman asked about being recruited for Ringo Starr's first All-Starr Band in '89; Lofgren recalled how thrilling it was, because he used to play Beatles tunes in his ninth-grade band. In the '80s, Starr attended a Springsteen show at Wembley in London; soon after, Lofgren and the legendary drummer cultivated a long distance friendship. "He said, 'keep in touch' and gave me his number," Nils recalled. "So I called every two weeks, which resulted in a phone number change." Another story that drew laughter surrounded an early All-Starr Band rehearsal and Ringo raving about the great sound. A crew member explained those special speakers mounted under the drums were monitors (The Beatles never had any). Next, Lofgren played "Girl in Motion," an awesome display of his harmonic guitar style. The subject of being able to jump whenever Springsteen calls an audible onstage has "become more prevalent in the last six years — especially the last three," Lofgren said. "Bruce is a madman... on the last tour, we played 240 songs. He will call out a song we haven't played in 30 years and we have to know how to fake it.... There were enough nights I missed a cue and he says, 'where were ya?' That's the beauty of the improv thing." Lofgren admitted that his long-overdue induction to the Rock and Roll Hall of Fame earlier this year as a sideman was only the second ceremony he'd attended. 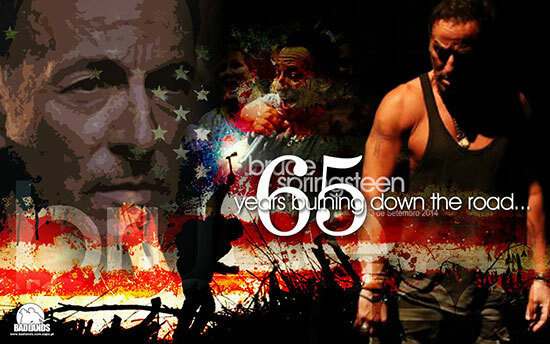 The first was 1999, when Springsteen was inducted as a solo artist. "Clarence was so hurt. We had to talk him into playing." If the E Street Band played an especially smokin' show in the years that followed, they'd often say sarcastically, "Not good enough for the Rock and Roll Hall of Fame," said Lofgren. His own induction this year, then, was "bittersweet. They should've figured it out before we lost Clarence and Danny [Federici]." Seated at the piano to play "The Sun Hasn't Set (On This Boy Yet)," Lofgren treated Davis Theater attendees to a glimpse at how he and Crazy Horse's Ralph Molina came to craft some music for Young's standard "Southern Man." 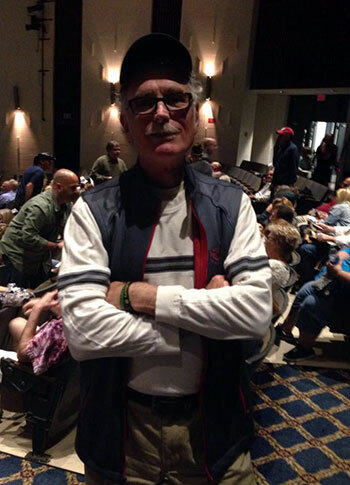 A fan question about how he still stays fit enough to do marathon shows with the E Street Band at 63 prompted Lofgren to talk about his double hip replacement and admit when he goes to the gym, "I'm too old to rest. I get into a heightened state of adrenaline onstage." As Lofgren prepares to do a handful of live dates in the coming months, he's "very excited and engaged to talk" [about the box set]. I haven't played my own songs in three years... people keep you in the moment." Finally, Lofgren capped the evening's live segment with the tender "Little on Up" (about "raising a kid by yourself") and a stunning "Keith Don't Go." 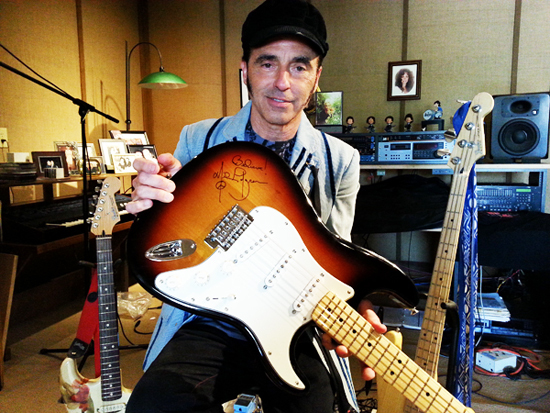 ENTER TO WIN NILS LOFGREN SIGNED STRATOCASTER! Fender and Backstreets have teamed up with Nils Lofgren to sponsor a sweepstakes — for a chance to win this Fender Stratocaster autographed by Nils! Sign up to enter at facethemusicnils.com. The very lucky winner will also receive a copy of the Face the Music box set, and everyone who enters will get a FREE download of the previously unreleased recording of "Keith Don't Go" featuring Neil Young. Plus: Nils Lofgren Week has launched on E Street Radio, celebrating the release of Face the Music with a new Nils interview with Dave Marsh, a set of Nils' best covers on Cover Me, and a new Guest DJ session with Nils focusing on his new box set. Click here for a complete schedule of programming and airtimes. 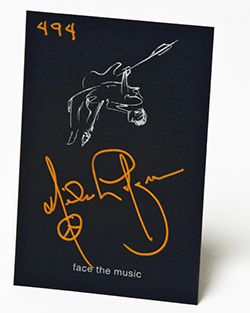 Ordering Face the Music: a small quantity of Nils' limited edition box set continues to be available through Backstreet Records. If you see a message that we're temporarily sold out, we encourage you to return and check again as others' shopping carts time out (sorry for any hassle, but stock is tight and we don't want to oversell). 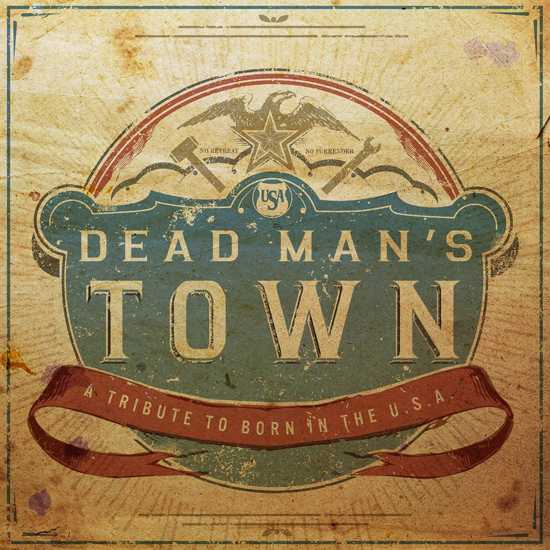 In recent weeks, tracks from the forthcoming Dead Man's Town: A Tribute to Born in the U.S.A. have premiered online at Rolling Stone ("Born in the U.S.A."), USA Today ("My Hometown"), Stereogum ("I'm on Fire"), and EW ("Glory Days"). Today, Backstreets.com has the debut of the next preview from the tribute album, Trampled By Turtles covering "I'm Goin' Down." Having just released their eighth album Wild Animals, Minnesota's Trampled By Turtles are on tour now with North American dates beginning August 16 and a return to Europe in November. Dead Man's Town is due out September 16, and you can order yours now from Backstreet Records for immediate shipment upon release — we're taking pre-orders for both the CD and the vinyl LP. 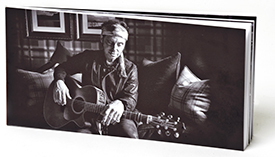 In 2002, in his first extensive interview with us, Backstreets spoke with Nils Lofgren about the possibility of getting more of his old music back out there in the digital realm, from reissues to outtakes. Prospects didn't look good: "Up until really '95 or '96," he told us then, "all my old music is owned by the record companies. These companies are not open to any creative discussions with me. I'm small potatoes with them — they don't want to bother with me. Most of my old records are out of print. I've asked them to put them back in print, and they've refused." Fast-forward 12 years, and after a smattering of reissues in and out of print along the way, Nils is about to release a treasure trove of material from 45 years of recording — comprised of his favorite tracks from every record and every label. 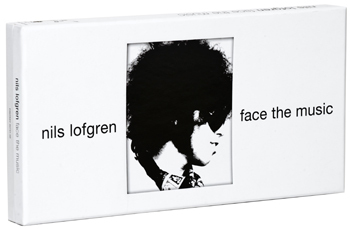 Face the Music, due Tuesday, is a limited edition box set with a whopping ten discs (nine CDs and one DVD, 169 tracks) covering Lofgren's entire recording career. "It's a momentous thing," Nils tells Backstreets now, "after having so much of my old music out of print, to have a company, Fantasy/Concord, that wanted to go back and let me hand-pick the best of 45 years.... for them to go back and get every track I picked, I gotta hand it to them. They worked out the deals. I think four of the nine CDs technically had to be made by the other companies! It just kind of blows my mind this exists, because over the years, I called the old companies and offered them five bucks a record to get some copies of old records out of print and they always said no." Click here to see the track listing, an amazing personal selection including two discs of previously unreleased material. Lofgren has provided an autograph for each copy of this limited run: "Every one has this beautiful sketch, a black card with a white 'flip' sketch by a great artist out here that I love, and I've signed it in really sharp, Dayglo bronze. I've numbered each one by hand and personally signed every one." Nils also wrote extensive liner notes, a massive project that turned into a book packaged with the dsics: "I was working with Dave Marsh, who was editing my writing — he insisted I write the story, which I hadn’t counted on. I was hoping Dave would take care of all that! But I couldn’t argue with him... when we looked at what I wrote and he edited, I have to admit, it was more interesting than having someone else, even someone familiar with your work, write the story. It’s probably the closest thing to a book I'll ever get to writing." 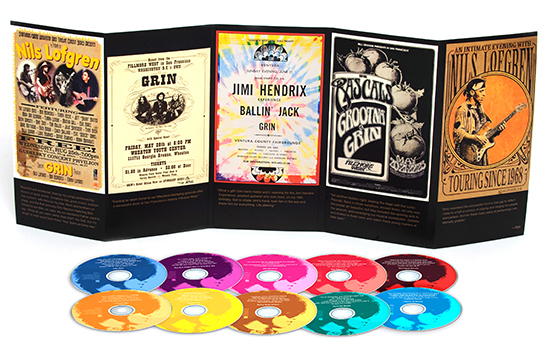 "It'll surely be my first, last, and best boxed set," says Nils. "It's 18 months of hard work representing 45 years." Nils also talked with us about getting back on the road himself: "I'm firing up the show that’s been dormant for a few years. It'll be exciting — I'm excited to get out and play, and we'll be posting all the dates on my website soon. A U.K. tour is in the works for January, and I am committed to playing September 26 and 28, Friday and Sunday, at the Hard Rock in Vegas. October 3 is the Talking Stick in Scottsdale, Arizona; October 4 is the Fox Theater in Tucson. Those are definites." Stay tuned in the coming days for an exclusive advance peek at the box set's book, as well as much more of our lenghty interview with Nils. 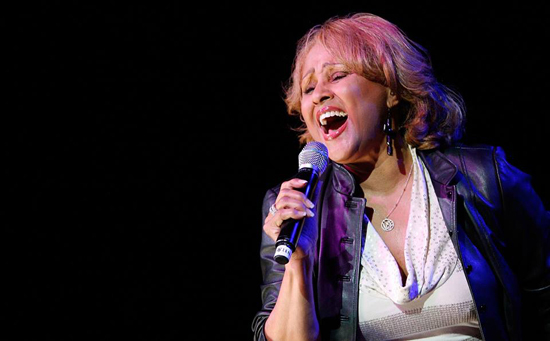 The fabulous Darlene Love has been on a hot streak of sorts lately, having been more in demand than ever as a live performer as a result of her acclaimed performance in 20 Feet From Stardom and ensuing appearance on this year’s Academy Awards broadcast. There is already a biopic reportedly in the works, and now things are about to get even busier for Darlene, as Steven Van Zandt has announced that he's going to be working with her on a new CD of original material which is shaping up to be a project of all-star proportions. In addition to doing some songwriting himself, Van Zandt is calling in favors from the likes of Elvis Costello, Barry Mann and Cynthia Weil, Bruce Springsteen, Mike Stoller and Carole King. Van Zandt told Rolling Stone that he had promised Love he'd make an album with her back in the early '80s, but that he's excited it's "finally" coming together. 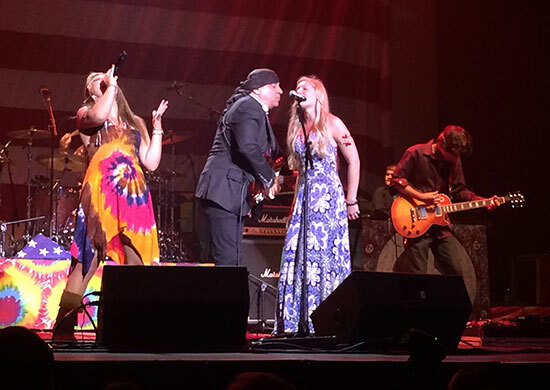 "Everybody I know that is a great songwriter, I'm talking to," Van Zandt said. "We're hoping to have an all-star album for Darlene, which she deserves." The CD, which will be released on Steven's Wicked Cool label, is tentatively scheduled for December release. 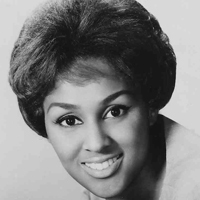 This is not the first time Steven has worked in the studio with Darlene Love; in 1992, he wrote and produced her holiday single "All Alone on Christmas," which appeared on the Home Alone 2 soundtrack and featured appearances by Van Zandt and other members of the E Street Band with the Miami Horns. In other Van Zandt news, Red Bank's Count Basie Theatre has announced that Steven and wife Maureen will receive the theater's inaugural Vanguard Award, which is being presented in recognition of "a lifetime of devotion towards the arts here in New Jersey." The Van Zandts will be honored on August 22 as part of "A Tribute to Woodstock & The Age of Aquarius," a theme concert curated by Steven that features performances by Rockit!, a collaborative of musicians who are part of the ongoing music instruction project hosted by the Basie. Tickets are $20 and will be on sale this Friday at noon either online or through the theater box office. 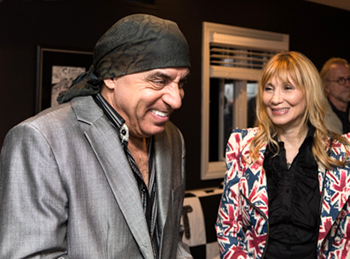 VIP packages that include a meet and greet with the Van Zandts are also available; call (732) 842-9000. The couple's Rock and Roll Forever project has just rolled out its "Rock and Roll: An American Story" social studies curriculum, a free online program designed to provide coming generations with instruction on U.S. history within the context of rock 'n' roll. The curriculum will be launched in Van Zandt's hometown school district of Middletown, NJ beginning this fall. In honor of Patti Scialfa's birthday today, a real blast from the past: newly uncovered footage of her performance at The Sounds of Asbury Park Concert, Paramount Theatre, Asbury Park, NJ, August 30, 1980. Happy birthday, Red! 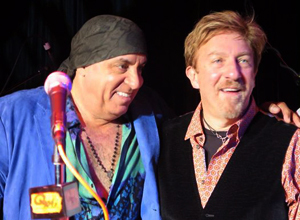 Last weekend, Steve Van Zandt joined Ken Dashow for Q104.3's Breakfast with the Beatles, with fellow guest Little Anthony — one of the music legends who inspired the Little Steven moniker. "One of my namesakes, for sure," Steve told Dashow. "The first record I ever bought was 'Tears on My Pillow'." 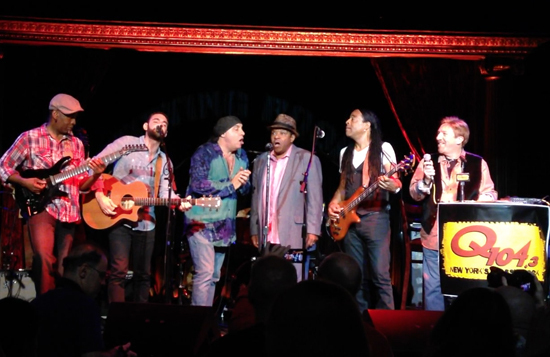 On Sunday, the two artists shared a mic on "All You Need is Love" [pictured above, video here], and Steve joined Living Color for "Back in the U.S.S.R." as well [video here]. Dashow also noted a special milestone: "You know what happened on this date in 1975? In Providence, Rhode Island?" [Steve: "No..."] "On this date in '75, on the first night of the Born to Run tour, Miami Steve Van Zandt played his first concert as a member of the E Street Band. How about them apples?" Steve actually recalls something about that night: "I remember coming from the studio, they were trying to finish Born to Run. They're still working on the album as we're leaving to go to the gig! Bruce is still doing overdubs and things — it was a crazy moment, the record wasn't quite ready, and all that drama. But it was fun, because me and Bruce had played together through the years in various bands; we went back ten years before that. Next year or so, we're gonna be friends for 50 years." 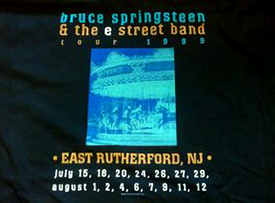 Hard to believe it's been 15 years since Bruce and the E Street Band took over the Meadowlands for a big chunk of the summer, for their long-awaited homecoming on the reuinion tour. Over the course of a month, from July into August, and 15 nights on stage, Bruce and the band played sold-out shows at the Continental Airlines Arena. It's the closest thing we've seen to a residency, before or since. At this point in '99, we were just three shows in... and their love was not letting us down. Stan Goldstein has put together a great retrospective posted today at NJ.com, looking back at the 15-night run with words, images, and video. Whether you saw none, some or all... maybe you were sleeping in an old abandoned beach house for the occasion, getting wasted in the heat... it's well worth your time. Read: "Bruce Springsteen's 15-night Meadowlands stand in '99: A look back"
This weekend, Steven Van Vandt will be co-hosting Breakfast With the Beatles with Ken Dashow (above) live on Sunday, July 20 at The Cutting Room. Little Anthony and Living Colour will each also be performing a Beatles song live. The show starts at 8am EST; if you're not in the NYC area, you can listen to a livestream at Q104.3.com. Justin Townes Earle, who has also been known to cover "Racing in the Street" and "Atlantic City," strips down "Glory Days" on the forthcoming tribute compilation, Dead Man's Town. EW.com has the debut audio: listen here. Earle says: "The importance of Springsteen cannot be overstated. Songs like 'Glory Days' speak to the heart. Looking back we will find that life is much more losing than winning. No matter our talents and drive, sometimes circumstance plays the biggest role of all." Dead Man's Town: A Tribute to Born in the U.S.A is out 9/16 on Lightning Rod Records. 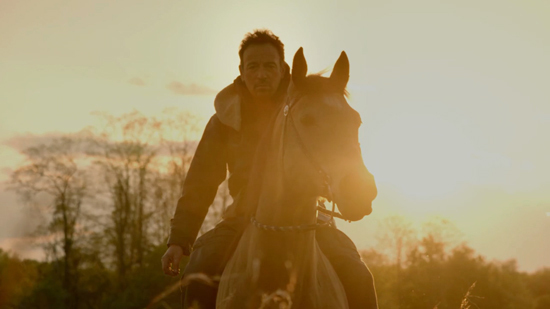 Tomorrow makes a week since the online premiere of Hunter of Invisible Game, the short film co-directed by Thom Zimny & Bruce Springsteen. Some fans have spent that time plumbing the depths of its meaning and mystery. Us, we found some ghosts of the past in their vision of the future. Zimny surely has favorite elements of his own to point out, and he'll be stopping by E Street Radio's Live From E Street Nation tomorrow morning to discuss the film with host Dave Marsh and his crew. Time permitting, selected listeners who call 877-70-BRUCE also may get a chance to have Thom address their own questions or comments about Hunter of Invisible Game. Live From E Street Nation with special guest Thom Zimny will air tomorrow, Wednesday July 16, 10am - 12pm ET on Sirius/XM channel 20. A repeat broadcast also will be aired on Sunday July 20, 6-8pm ET. LERA LYNN'S "RITE OF PASSAGE"
Up-and-coming Americana artist covers something besides "I'm on Fire"! Above, an exclusive clip of singer/songwriter/guitar picker Lera Lynn taking on "Fire" live at Nashville's Cotton Mill Studio. "Learning to play a Springsteen song is a rite of passage for all serious songwriters," Lynn says. "There are few who can compete with his penchant for melody and simple, yet extremely effective lyrics. Adding 'Fire' to my repertoire was based on a request from a fan who loves us both, and he couldn't have chosen better. I really feel that I've been able to reach an intimate place with this song and sing as if it were my own. Damn it, I wish I'd written it!" Lynn's new album The Avenues will be released on September 9, featuring lead single "La Di Da." Find more at leralynn.com. 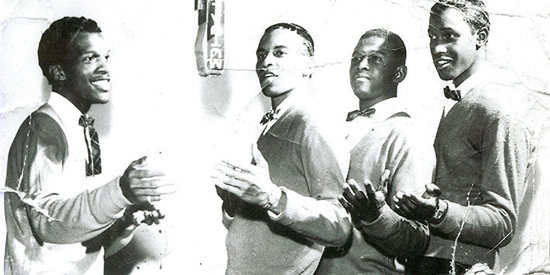 Beginning this fall, Monmouth University's Pollak Gallery will host a pair of special photography exhibits related to Asbury Park's music history. 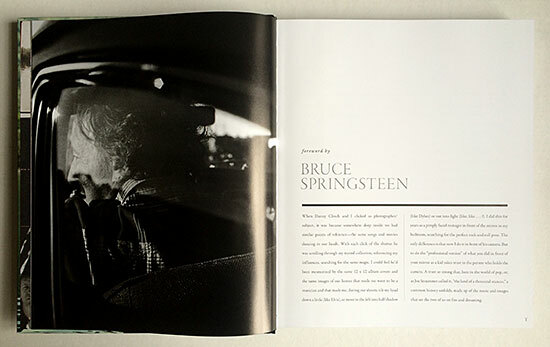 The first, titled "Glory Bound: Photographs by Barry Schneier," is a collection featuring Bruce Springsteen, Van Morrison and Patti Smith in performance at what were pivotal moments in their respective careers. 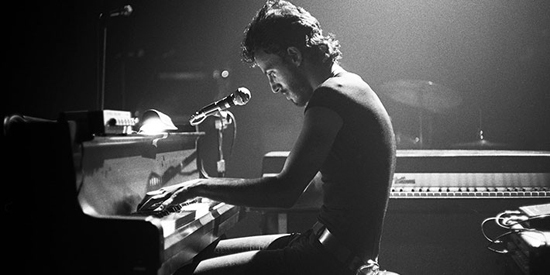 The photos of Springsteen are from his legendary May 9, 1974 appearance at the Harvard Square Theatre in Cambridge, MA, the show that prompted music journalist and future manager Jon Landau to declare that he had seen "rock and roll future." Indeed, the rarely seen images of Bruce and the band are striking: he and the E Streeters seem impossibly young and full of promise, their future as yet unwritten. "Glory Bound" opens on Sep. 2, with an opening reception and gallery talk on Sep. 11, while the West Side exhibit opens Feb. 1, 2015, with an opening reception Feb. 4. Both exhibits are free; see the Monmouth University events calendar for further information. Monmouth University is also the home of the Bruce Springsteen Special Collection. A behind-the-scenes look at the Hunter of Invisible Game shoot, above, with Ludo Roveda as "Boy" and filmmakers Thom Zimny and Bruce Springsteen. 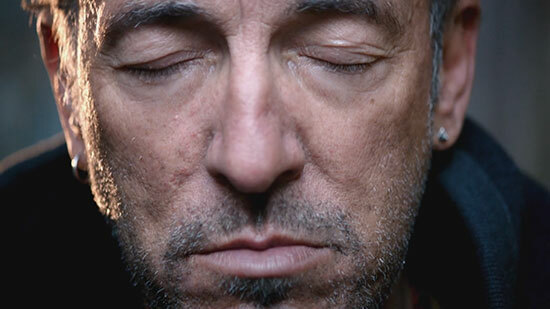 The ten-minute film premiered yesterday on brucespringsteen.net. Hank LoConti Sr., founder and owner of the legendary Agora club in Cleveland OH, died yesterday at the age of 85. In addition to starting the Cleveland Agora in 1966 and turning it into a national brand, buoying the careers of countless rock acts along the way, LoConti is also credited with helping to bring the Rock and Roll Hall of Fame to Cleveland. The Agora played an important role in Bruce Springsteen's career, with several performances there captured for posterity — one of them becoming one of the most famous bootlegs of all time. Springsteen first performed at LoConti's club on June 3, 1974, a two-hour show edited to 50 minutes for broadcast on WMMS. But the big one was August 9, 1978, still a legendary performance thanks to the live broadcast celebrating the station's tenth anniversary. In 2010, Hank appeared on a panel at the Rock Hall to discuss the history of Springsteen in Cleveland [right], of which Bruce's Agora appearances are no small part. By 1978, Springsteen had graduated to larger venues; describing how that 8/9/78 club gig came about, LoConti recalled, "[Springsteen's agent] said to me, 'How would you like to have Springsteen at the Agora?' I said, 'Well, I'd like to walk on the moon, too! But it isn't gonna happen!" In his book The Buzzard: Inside the Glory Days of WMMS and Cleveland Rock Radio, WMMS Program Director John Gorman tells how it did happen: "Darkness was Springsteen's first album in almost three years. Columbia wanted to use it to reignite his career... 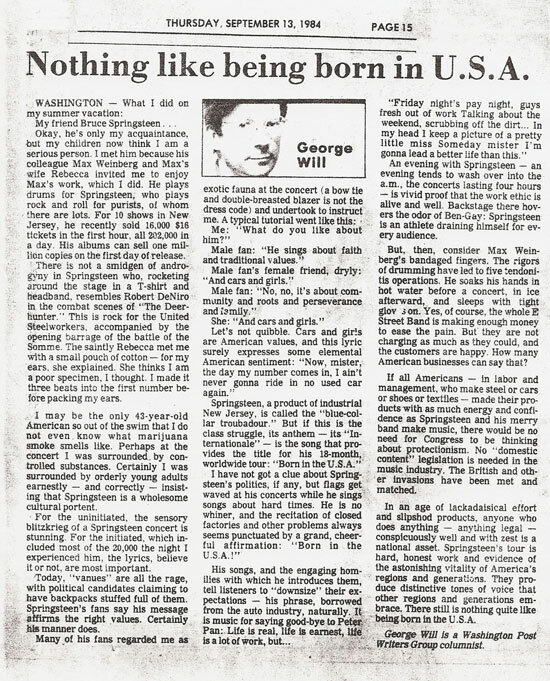 They suggested a series of free concerts, broadcast from key markets on ad hoc regional radio networks.... Steve Popovich and others at the label insisted that Springsteen do Cleveland and the Agora, which he believed was the best rock and roll club in America. Fortunately, it turned out to be an easy sell. Everyone in the Springsteen camp wanted the deal too. 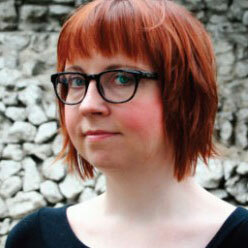 The tie-in would be WMMS's tenth anniverary, the Agora would be the venue, and we would broadcast the show regionally." LoConti continued, "That '78 show, I can't even tell you... I've been in the business 45 years, I've watched many acts, been to hundreds of his shows, but that show had something about it — I don't know how you can beat it! The show was three hours, and we recorded every inch of it — in fact, I still have the 24-track that we recorded the show on. To have a guy play a three-hour show in a club, it was unheard of." "My mother, who was 79 at the time — I thought that was old then, but I just passed that mark — was there. He did an intermission after the first hour and a half. So during the intermission, we moved her up. We set the stage with a 'T' coming out into the audience, and so we set her right at the corner of the T. So you can picture Springsteen playing with a 79-year-old woman, sitting there watching him. She enjoyed every bit of it. We took her backstage afterwards, and she told him what a good-looking man he was! And that some day he was going to be a superstar. She didn't realize he was already a superstar." "We were sitting there with five cameras, I remember Wild Horses was the opening act. And Southside calls, and he says, "You gotta hold the show. I'm getting on the stage with Springsteen, and then I'm coming there.' I said, 'What time are you gonna be here?' He said, 'I can't tell you, but it's gonna be after 11.'... Finally, Southside gets on stage, and he's got Miami Steve with him. And about 20 minutes after he got on, here comes Clarence Clemons. Well, the anticipation was there, and Springsteen got there for the last 28 minutes of the show. Which actually ruined our [broadcast]! Springsteen and his managers both said, yes, we could use the 28 minutes. So we put our show together, we go to New York, we show it to Miami Steve. Miami, after looking at it, said 'You know what? I'm not going to allow you to use the 28 minutes.' We asked him why, and he said he didn't want Southside tied to the apron strings of Bruce Springsteen. Which actually ruined our show — did you ever try to do a show and you lose the finale? This was the finale! Southside always closed his show with 'Havin' a Party' and things like that, and here we're stuck with the top end of the show!" Of course, that footage eventually surfaced: courtesy of YouTube, watch "The Fever" above, along with "I Don't Wanna Go Home" and "Havin' a Party" at the Agora in the wee hours of August 31, 1978. A job well done, Hank. Rest in peace. At a website near you. 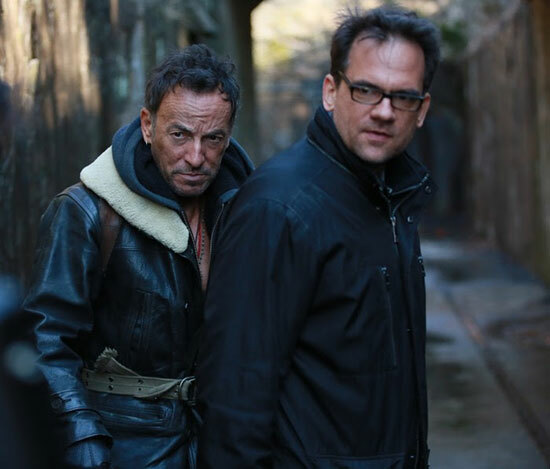 Thom Zimny & Bruce Springsteen's Hunter of Invisible Game is a ten-minute, post-apocalyptic vision to accompany the High Hopes track, posted today along with a note from Bruce promising, "We take this break with a sense of joy, renewed purpose and filled with the spirit to bring you our best in the future. We've still got a few surprises for you..."
E Street Radio’s Live From E Street Nation, which normally broadcasts on Wednesdays 10am - 12pm ET, will remain on the air for an extra hour tomorrow to discuss the online premiere of Thom Zimny & Bruce Springsteen's film Hunter of Invisible Game (marking Springsteen's first official credit as a filmmaker.) Host Dave Marsh and his crew will be joined by Backstreets.com's own Shawn Poole. Tune into Sirius/XM channel 20 to catch all of the action, and call 877-70-BRUCE for a chance to give your own review of the film. WHAT IS "I'M GOING TO RUN THE WHOLE GODDAMN BOARD, ALEX"? 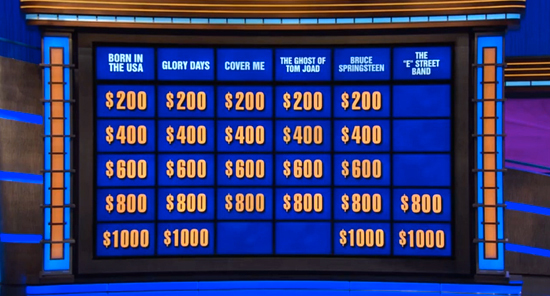 Jeopardy show #6874. Click here for video; view all answers on j-archive.com. In the year of its 30th anniversary, Born in the U.S.A. is getting the tribute album treatment from Lightning Rod Records this fall. The label has annouced that they will release Dead Man's Town, an album featuring 12 Americana and alternative artists covering the Born in the U.S.A. album, start to finish. This isn't the first time such an undertaking has occurred — in 2000 Sup Pop Records released Badlands: A Tribute to Bruce Springsteen's Nebraska — but Dead Man's Town contains tracks by some very popular and up-and-coming acts, recorded exclusively for this album. Jason Isbell, a major Springsteen fan who has been known to cover "Atlantic City" live, starts off the proceedings with a stripped-down take on "Born in the U.S.A." (based on Bruce's original demo) that also features Isbell's wife, Amanda Shires. Isbell received high praise from Springsteen himself during the NPR interview that aired on January 15; of Isbell and his critically acclaimed Southeastern album, Bruce said, "I believe he was part of the Drive-By-Truckers. He's got a lovely album out himself." 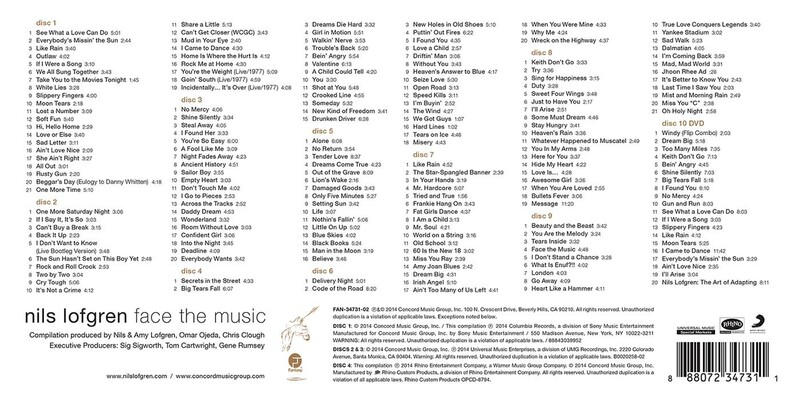 Three of the album's 12 tracks — "Cover Me" by Apache Relay, "No Surrender" by Holly Williams, and the Isbell/Shires track — were produced by Dave Cobb, who manned the boards for Isbell's Southeastern album. With Born in the U.S.A. producing seven top ten singles on the Billboard Hot 100, familiarity might be an issue for some folks, but the performers involved in Dead Man's Town have put their own respective spins on the tracks that make up the iconic album. Rollingstone.com, premiering the lead track yesterday, wrote that the tribute's artists are "reimagining Born in the U.S.A....with a reduced approach more influenced by that of the acoustic Nebraska." Luther Dickinson of North Mississippi Allstars, who close the album with 'My Hometown," says "any of those songs could be played with acoustic guitar alone and still be great." Other artists paying their respects include Joe Pug ("Downbound Train"), Justin Townes Earle ("Glory Days"), Low ("I'm on Fire"), Quaker City Nighthawks ("Darlington County"), Blitzen Trapper ("Working on the Highway"), Ryan Culwell ("Bobby Jean"), Trampled By Turtles ("I'm Goin' Down"), and Nicole Atkins ("Dancing in the Dark"). Dead Man's Town is due out on September 16. Last Friday, the Drive-By Truckers and the Hold Steady teamed up at the Stone Pony in Asbury Park — and if that sounds like the perfect storm* for a Springsteen cover, well, you're damn skippy. Our shore correspondent Lisa Iannucci, who was in the house, reports, "Both bands are longtime fans, yet neither even said Bruce's name, letting the intensity of the show — and the music itself — do the talking. And who else but the Truckers would cover Neil Young and Jim Carroll while also evoking Skynyrd?" Watch their joint set above; tune in around the 7-minute mark (or 7:30 to avoid a NSFW intro) to hear "Adam Raised a Cain." *Speaking of storms and the Stone Pony: on a far less fun note, tonight's Southside Johnny show on the Summer Stage, an annual tradition, has been postponed due to weather, rescheduled for August 2. See stoneponyonline.com for details. 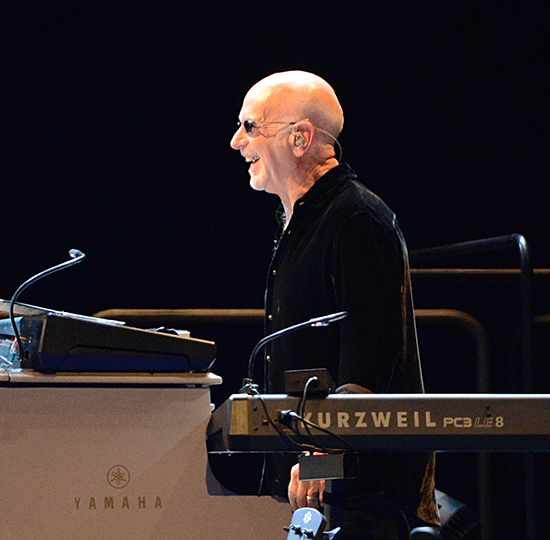 A very happy birthday to Professor Roy Bittan, born July 2, 1949, who turns 65 today! Today, Bon Jovi reissues its 1988 New Jersey album as a Super Deluxe Edition to celebrate the thirtieth anniversary of the band’s formation. 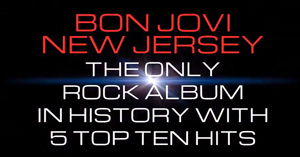 What's notable about New Jersey, according to this official promotional video, is that it's "THE ONLY ROCK ALBUM IN HISTORY WITH 5 TOP TEN HITS." Of course, Born in the U.S.A. had seven. Springsteen's 1984 album is tied with Michael Jackson's Thriller for most top ten hit singles. But if it's exactly five you want, and no more... look no further! Monmouth University's video overview of the 9/20 "Fifty Years Forum"
Stewart Francke's "best of" CD wiill include his duet with Springsteen... Kickstart it! Maureen and Stevie Van Zandt accept the #icebucketchallenge from David Cook. Tom Morello takes the #icebucketchallenge and passes it on to Bruce. Soul legend Sam Moore will be featured on CBS News Sunday this weekend (8/17), interviewed at the Stax Museum in Memphis.